It's the final post for the 4 x 7 Sewing Challenge hosted by Sarah at Berry Barn Designs. 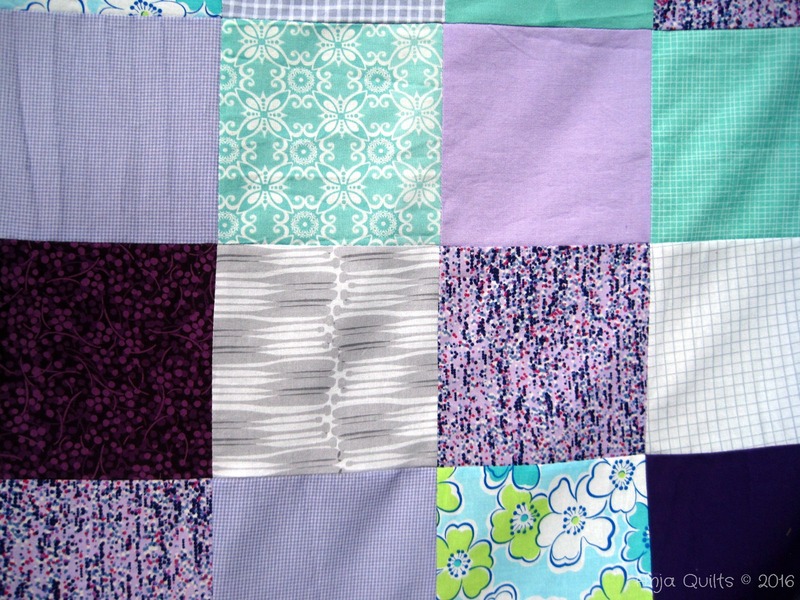 I sewed on the binding for the Additions baby quilt -- see finish here. 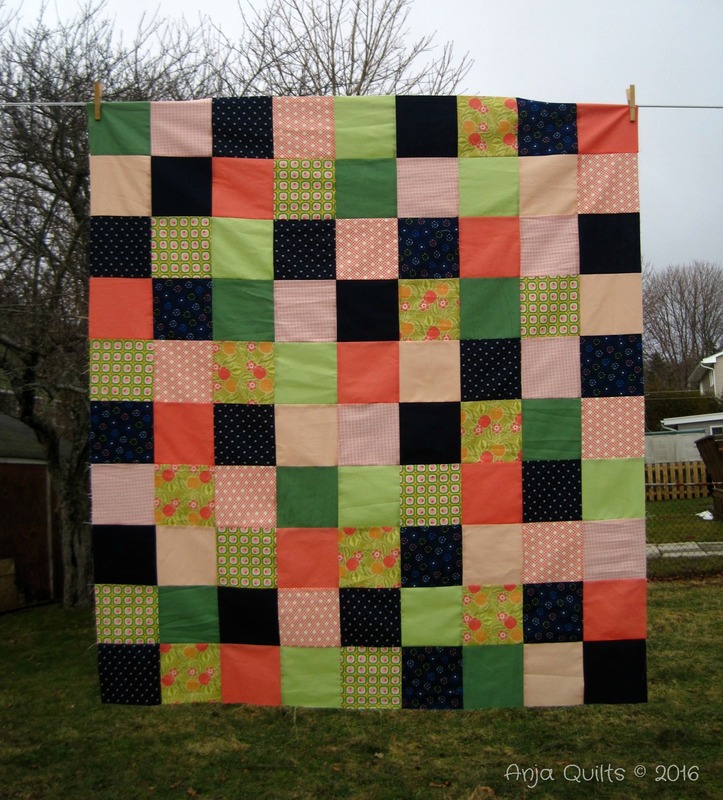 Although I did not do any quilting, I did lots of quilting-related activities. I won a few online prizes recently, so I spent some time choosing patterns and stickers. I started preparing the backing for my Meadow Mist Designs mystery quilt (quilt top finished here). 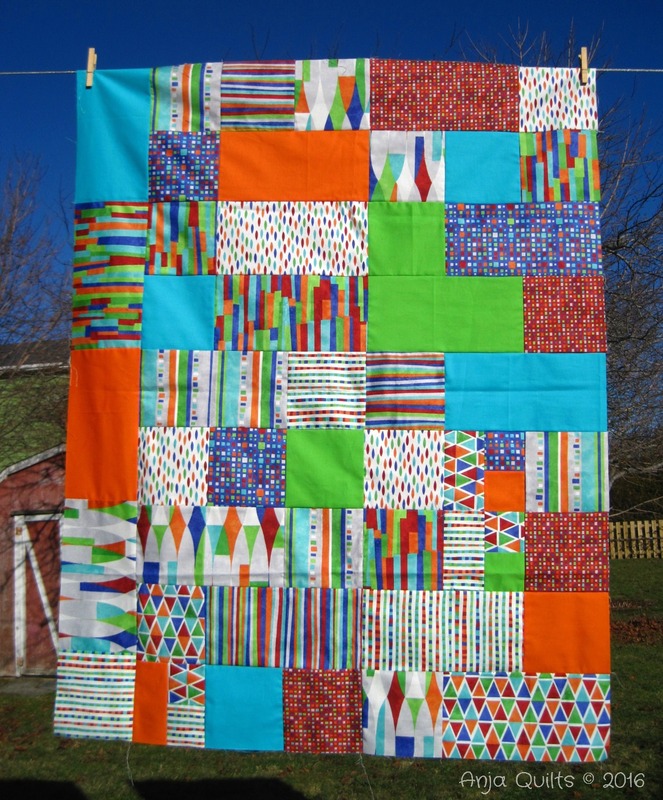 I worked on plans for the first ever Maritime Modern Quilt Guild retreat. 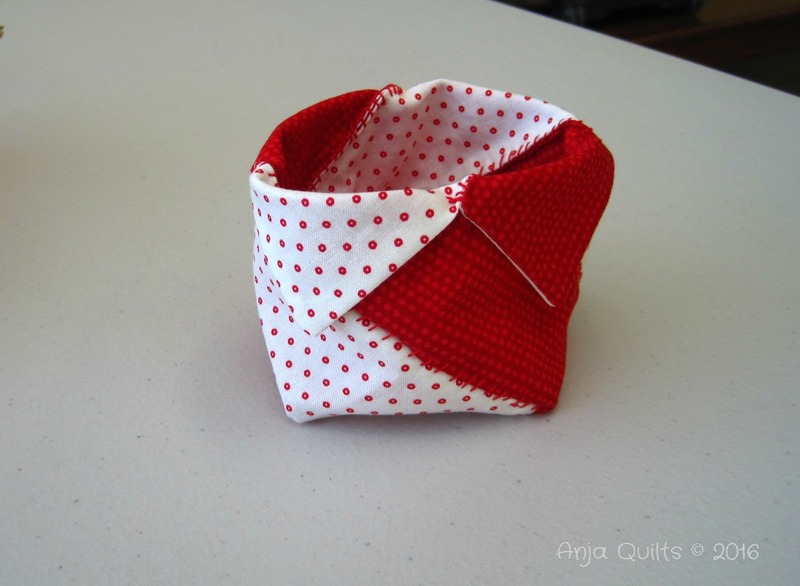 I started sewing together my mini EPP hexies. 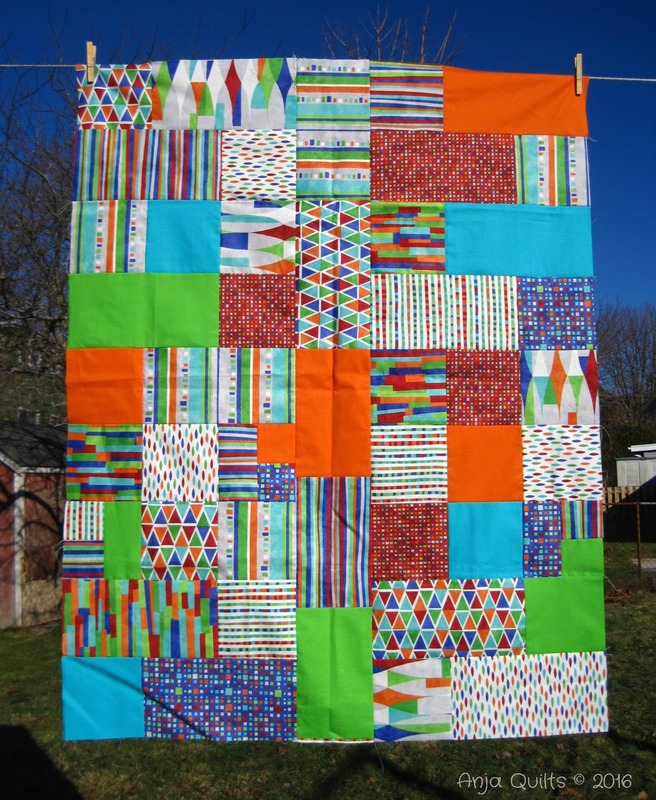 I finished piecing the backing for the mystery quilt. 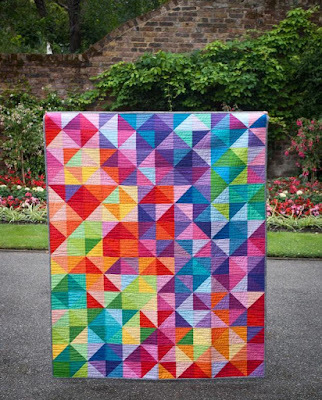 It's odd calling it a mystery quilt now that I know what it looks like. 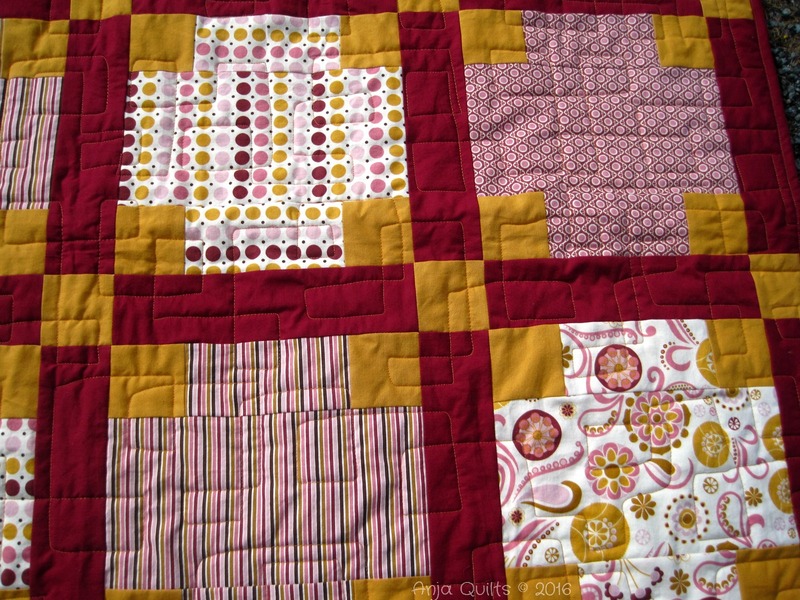 Again another day of no quilting, but I did something so very crazy on the spur of the moment. 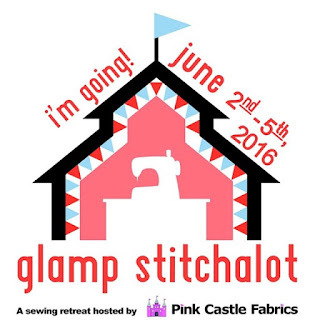 I'm going to Glamp Stitchalot in Ann Arbor, Michigan, in June. In less than 24 hours, four of us booked event tickets, a flight, and a hotel. Oh my! We're going to meet Elizabeth Hartman and Carolyn Friedlander (among other teachers). I still can't believe it. I'll believe it soon enough when the credit card statement comes in. MMQG had it's monthly Sew In. I worked on a WIP bag (pattern by Crazy Mom Quilts); finished the next Modern HST Sampler block; started work on Notched (pattern by Quilting Jetgirl); and worked on Inside Out (pattern by Cluck Cluck Sew). I attempted a new FMQ motif on the mystery quilt. I watched Angela Walters' Dot-to-Dot Quilting class on Craftsy. Clearly, I need to go back to pre-school to learn how to draw a straight line. More quilting on the mystery quilt. It's been a productive February. 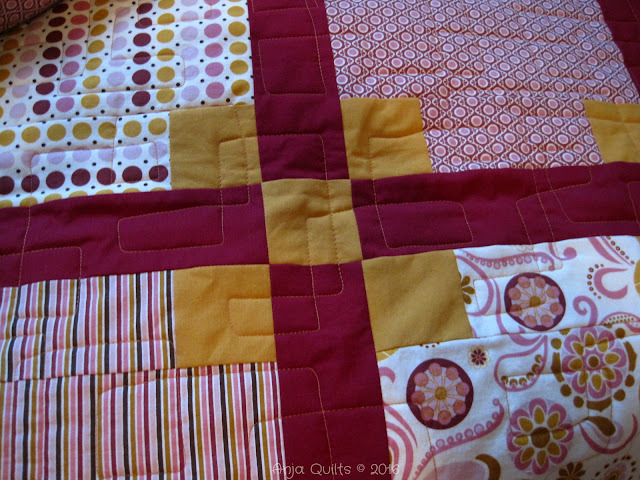 On the few days that I wasn't able to do any physical quilting, I worked on quilting-related projects. So I consider the 4 x 7 Sewing Challenge a success. Thanks to Sarah at Berry Barn Designs for hosting. My February OMG goal was to quilt the Additions baby quilt, which was designed by Julia @ Jada's Quilting Adventures designed the pattern, and I was one of her testers. Even though I had decided to do boxy meander FMQ, I had been procrastinating for weeks because I thought it would be difficult. What an awesome motif! I definitely need more practice and see where I need to improve, but this is a motif that I will definitely use again. This is the second finish of my Q1 FAL goals that I set back in January. It's hard to believe that February is almost over and that there is only one more week left in the 4 x 7 Sewing Challenge hosted by Sarah at Berry Barn Designs. I made the next Modern HST Sampler block (stay tuned for the reveal) and started on the February Stash Bee block. I also cut the fabric for my commissioned baby quilts. 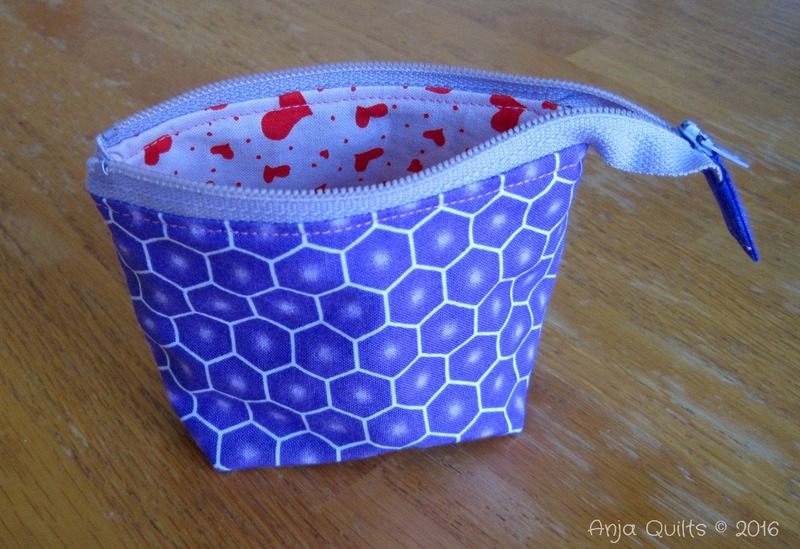 I finished making EPP mini hexies for a project for which I now can't find the pattern. I also worked on a pillow for charity using a pattern I was testing that was created by Linda @ Scrapmaster (stay tuned for that reveal as well). I pieced the commissioned baby quilts and finished the February Stash Bee block. 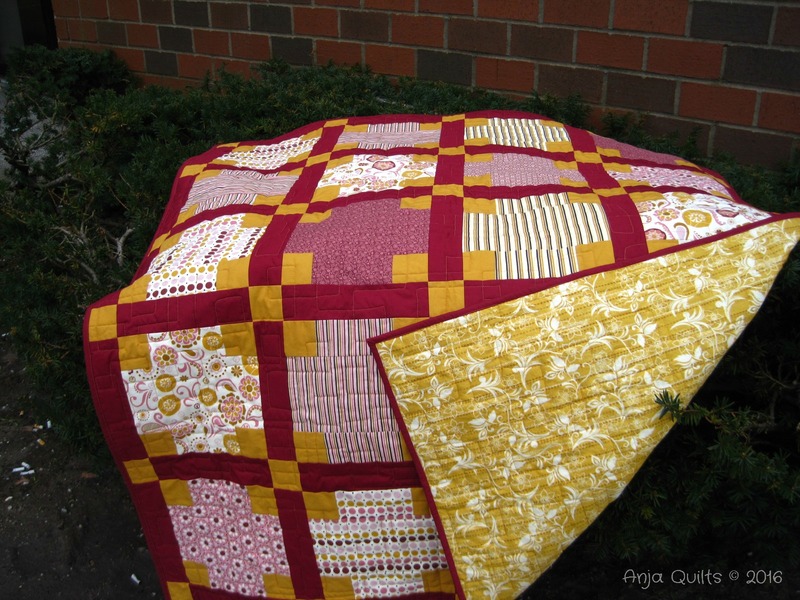 I also managed to quilt both Fat Quarter Frenzy charity quilts. I quilted the first of the commissioned baby quilts. Here's a sneak peak. 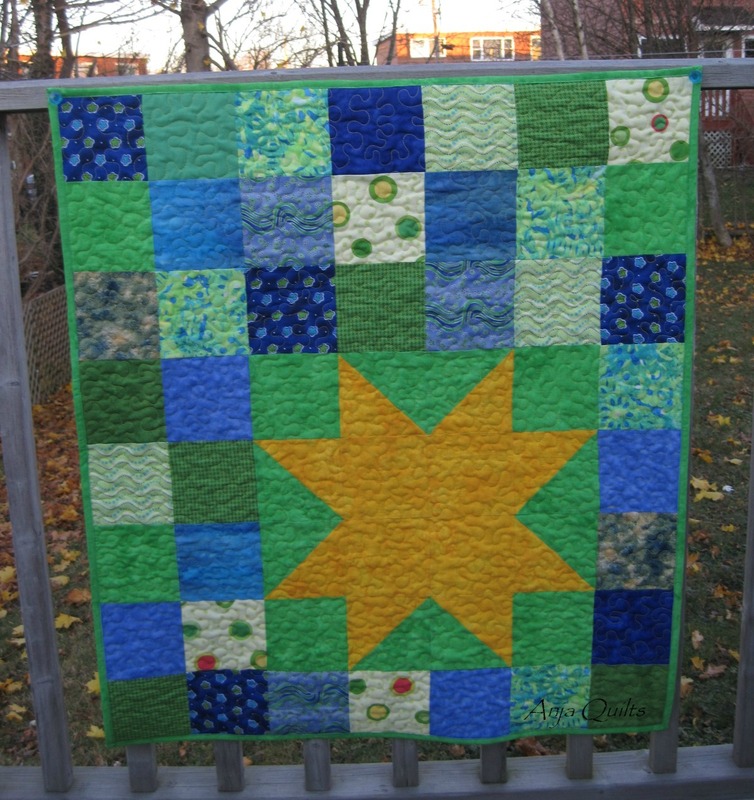 I quilted the second commissioned baby quilt. I also worked on my blocks for the Inside Out pattern by Cluck Cluck Sew. I started this project back in January and then forgot about it. I've been procrastinating about quilting the Additions baby quilt. 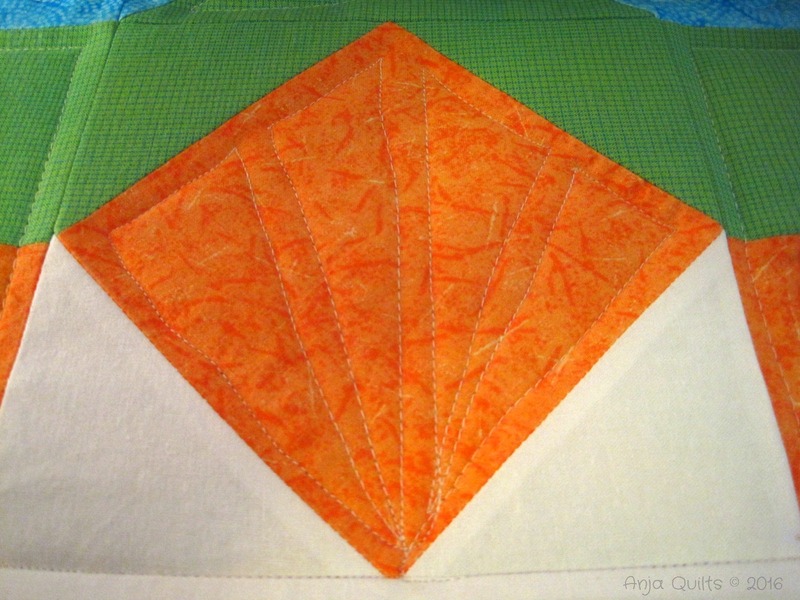 I received a lot of feedback to try a boxy meander for the quilting, but I thought it would be difficult to do, so I kept putting it off. I finally jumped in and just started quilting. Imagine my surprise...it's not hard at all. It's not perfect, and I see where I need improvement, but it's a great quilting motif. Here's a sneak peek. 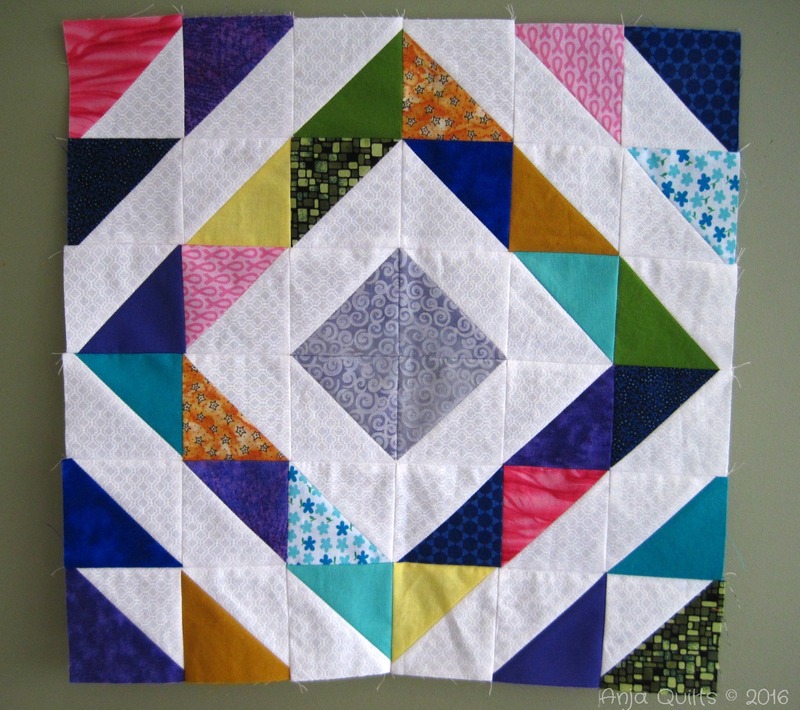 I started piecing together my EPP mini hexies. And I finally hemmed a pair of pants that have been sitting around pinned for far too long. The excitement was so overwhelming that I didn't hem the second pair -- I'll save that fun for another day. I hate hemming pants, but I also hate to pay the tailor to hem them when I know I can do it. Week 3 was a great success. I like these challenges as it helps to keep me focused on projects. With so many other things that need to be done (housework, volunteer work, etc. ), it's easy to get sidetracked. 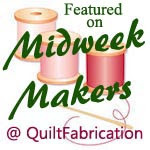 Here's to another productive week of sewing! Today marks the second anniversary of my blog!! I started my blog late on a Friday night in an attempt to win a prize. Adrienne @ Chezzetcook Modern Quilts was hosting The Library Project. My first post was pretty bad -- not a photo to be seen. My friend Jenn @ A Quarter Inch from the Edge had been encouraging me to start a blog. But I didn't know what I would say in a blog and didn't think that anyone would read it. I am so very glad that Jenn continued with the encouragement and that I finally accepted the challenge. I have met so many wonderful people and have learned so much. 108 followers on Bloglovin. Thanks for all the love! Since I can't figure out a way to have everyone send me an anniversary gift J, I'm having a giveaway instead. Leave a comment indicating what you would send me for an anniversary gift. Virtual gifts will be just as fun. A winner will be selected randomly at 8:00 a.m. Atlantic on Sunday, February 28, 2016. The giveaway is open internationally. If you are a no-reply blogger, make sure you leave your e-mail address in your comment; otherwise, another winner will be selected. Here's to many more years of fun and adventure. My addiction to zippered pouches and drawstring bags continues. Karen from Ohio suggested a swap -- she would make mini drawstring bags for me if I made mini zippered pouches for her. Deal! I received these wonderful drawstring bags. They are about 4 x 4 inches. And Karen included a little thread catcher. I love getting goodies in the mail. Karen said that she likes blue, purple, pink, teal, and red. 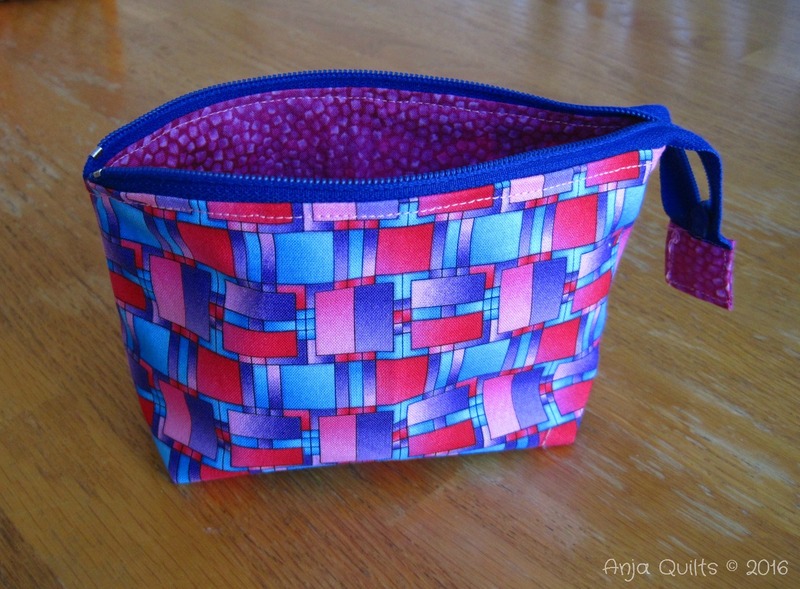 This purple and red pouch is about 3 x 4 inches. I managed most of her favourite colours in this mini that's about 4 x 6 inches. I also included a larger blue pouch (5 x 9 inches). 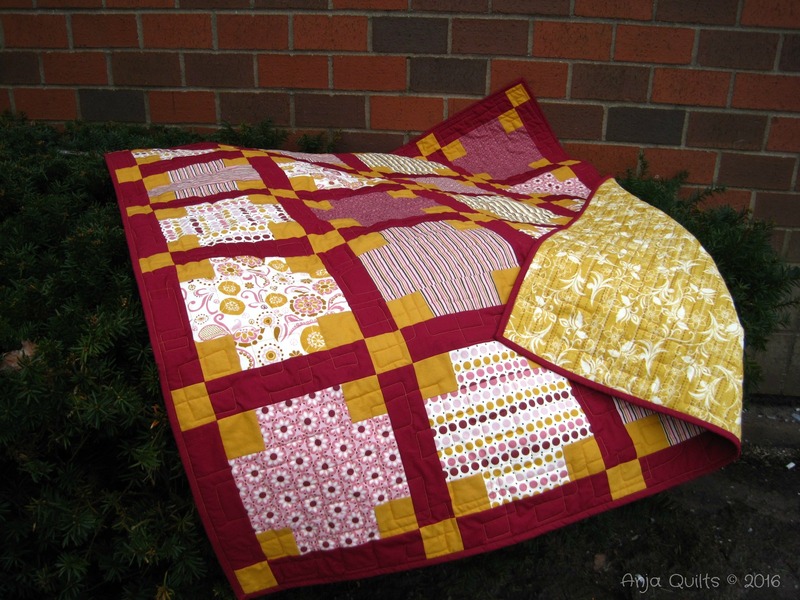 Last week, I was given the opportunity to make two commissioned baby quilts. The customer picked the colours. I went fabric shopping on Friday and cut fabric on the weekend. The customer is hoping to get them as quickly as possible, and because it is a simple layout, I was able to get both tops pieced this week. I think easy loop FMQ to finish them off this weekend. They finish around 40 x 46 inches. 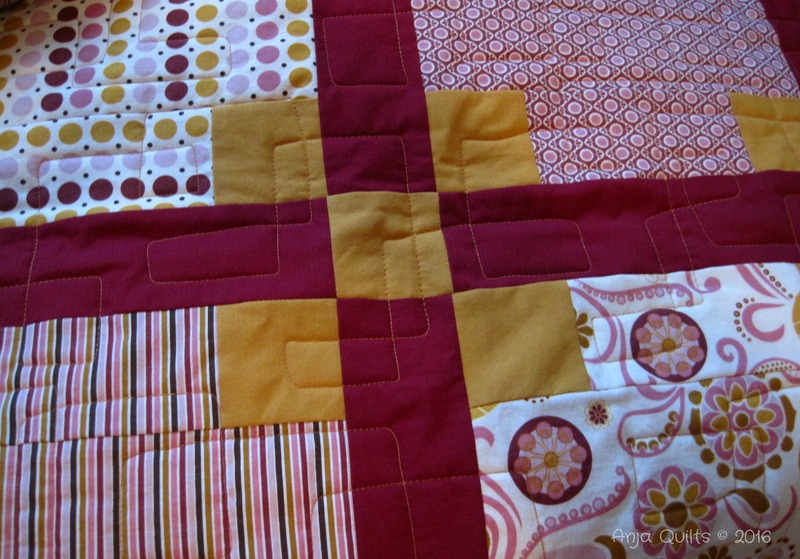 We're halfway through the 4 x 7 Sewing Challenge hosted by Sarah at Berry Barn Designs. 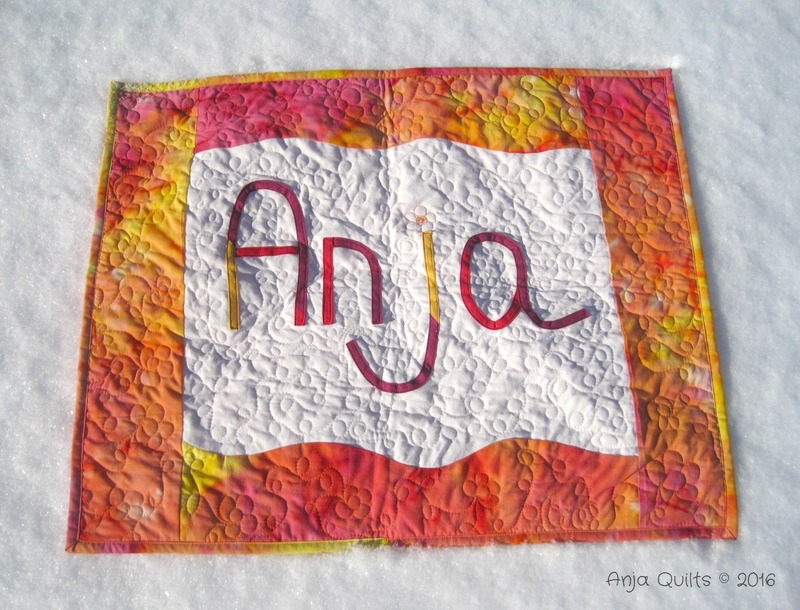 I worked on my January Aurifil block, which I unveiled here. I quilted and added the binding to my January Mighty Lucky Quilting Club bias tape challenge, which I unveiled here last week. No time for sewing as it was the monthly meeting of the Maritime Modern Quilt Guild. I went fabric shopping for two commissioned baby quilts. Even though this is the Year of Stash, I did buy some fabric. But...in my own defence....wide backing for $10.50 a metre cannot be left on the shelf, so I bought 1.5 metres. And I couldn't resist...orange fabric for $1.75 a metre. What can I say? I love orange, so I bought 2 metres. I also bought something for a giveaway (see below). I was pillow pattern testing for Linda @ Scrapmaster, and although I had the top completed, I only just got around to quilting it. I'll be sharing the finish this week. 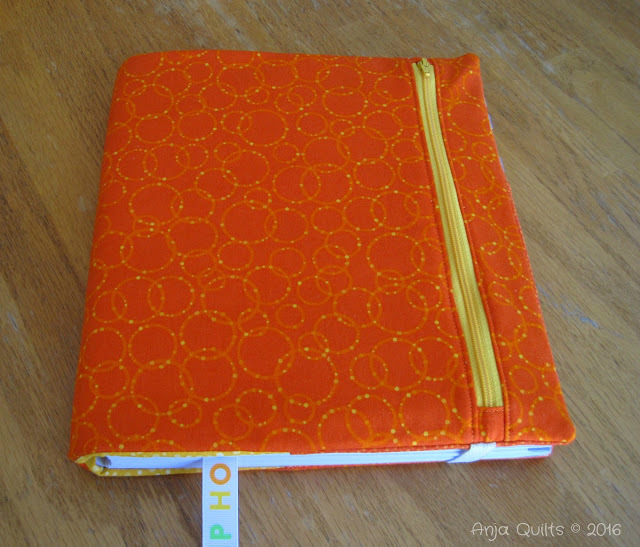 I also fixed my Quilter's Planner cover (and just realized that I haven't blogged about making it). I cut mini charm squares for the Birthday Bonus Club and worked on my commissioned quilts. 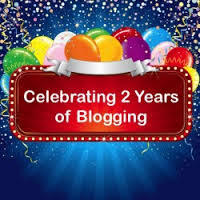 Sunday, February 21 will be the second anniversary of my blog. Where has two years gone? I have had so much fun meeting so many great people and learning new things. 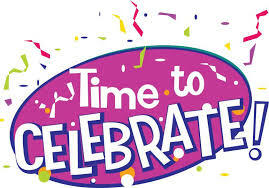 Stop by for the celebration and enter to win. Welcome to the Craftsy Sweetens Up My Quilting Life Blog Hop hosted by Sandra @ Musings of a Menopausal Melon and Julie @ Pink Doxies. Craftsy helps you be creative by making it easy and convenient to learn new things through classes and patterns (and they have lots of supplies!). Right now, every class featured in the blog hop is on sale at 50% off for one week! If you were thinking about a class, but were waiting on an inside scoop on whether it was a good fit for you, read the reviews on the blog hop. Craftsy showcases lots of patterns, many of which are free. 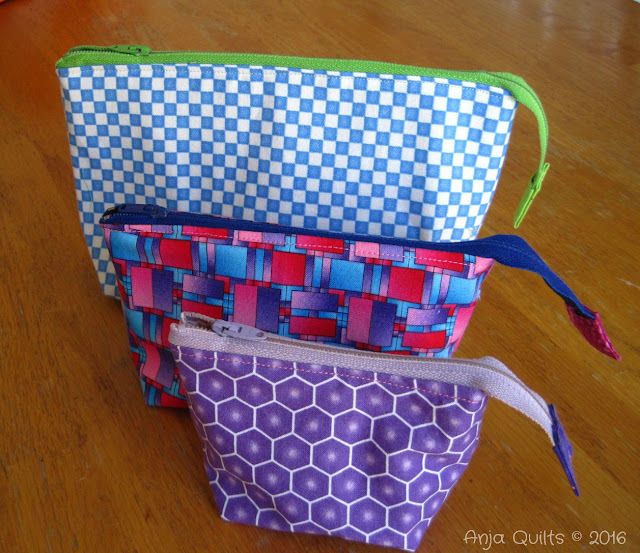 I'll going to share my thoughts on four free patterns. Visit Tish @ Tish's Adventure in Wonderland. 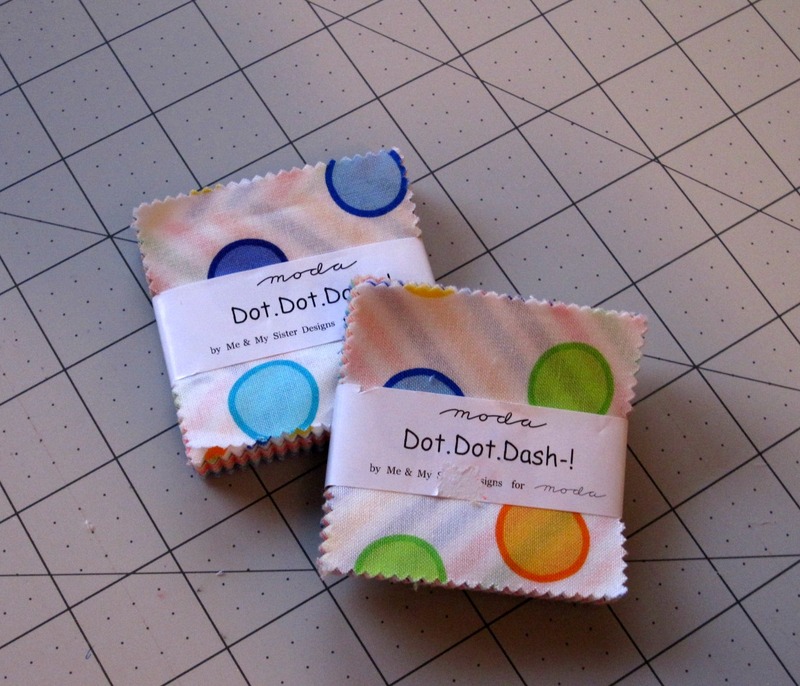 She'll be reviewing two classes: "Dot to Dot Quilting" by Angela Walters and "Shoot It! A Product Photography Primer" by Caro Sheridan. This is a great project! They really do sew up in an hour. The instructions in the pattern are great, and there are a lot of photos. Fusible fleece is used on the exterior fabric. This was my time first time using fusible fleece. I found the basket a little floppy, so I think next time I'll use fusible interacing to give the basket some stability. It's a great basket to hold just about anything: fabric, notions, face cloths, diapers -- the possibilities are endless. 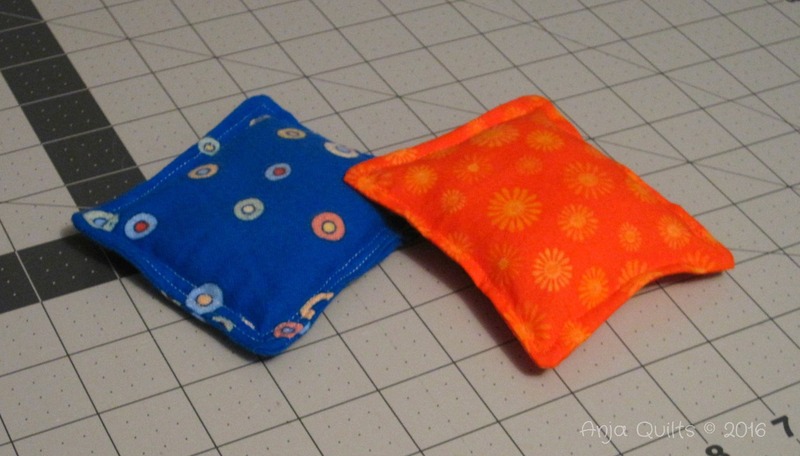 I'm always cold, so I thought these hand warmers would be a great project to try. 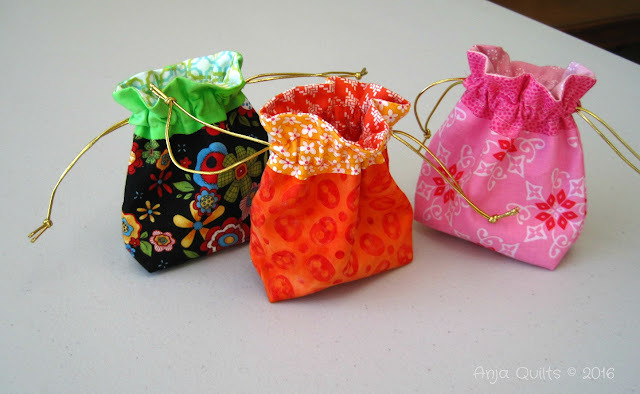 They are quick and simple to make and are a great way to use scraps. 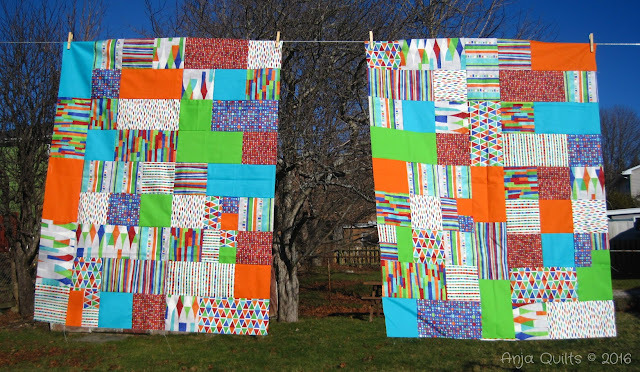 The blue one is made with flannel, and the orange one is made with cotton. As an added touch, I top stitched around the outside. Unfortunately, I put too much rice in the orange one. They both hold the heat well, but I haven't used them for any length of time so can't say how long the warmth lasts. These hand warmers would make a great little add-on to a gift. This is a great beginner project. 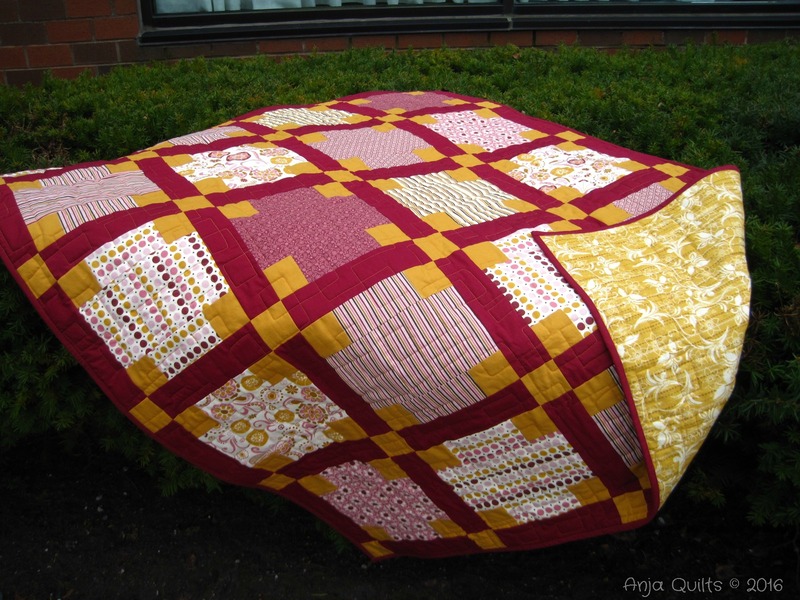 There are instructions for both a baby quilt and a throw size, with two different block sizes provided for both. The instructions are very clear, and it's a project that can be sewn up quickly. 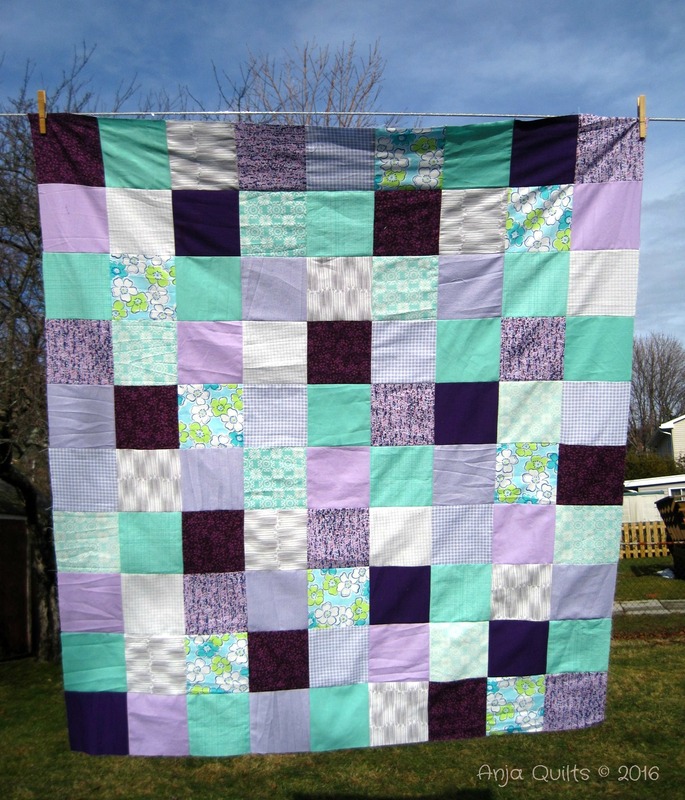 I've made two baby quilts already, and I plan to use this pattern again. 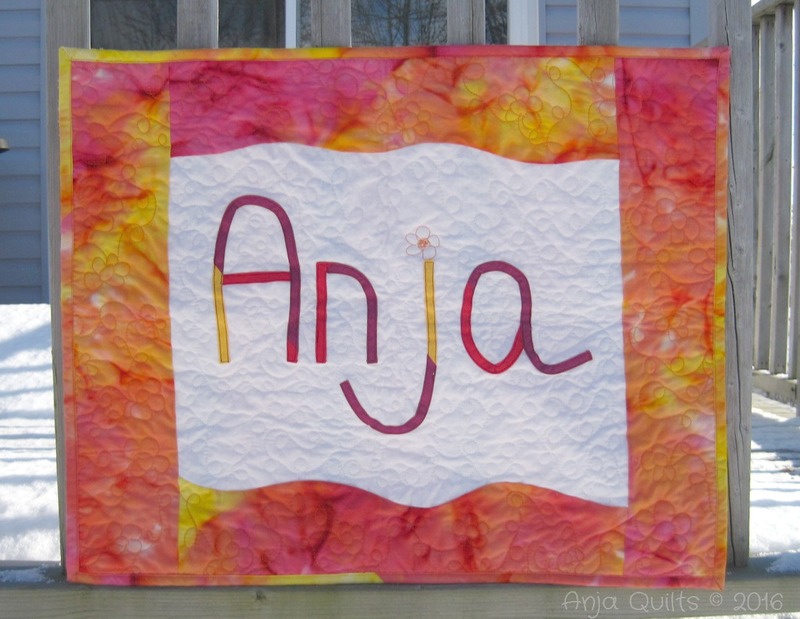 I chose this pattern because the colours were so bright and vibrant...and I love Kona! Unfortunately, I haven't had time to finish the pattern yet. All my squares are cut out and ready to be cut in half to make HST's. The pattern has two sizes, and the instructions are very detailed, with lots of photos. A colour legend is provided, with a column for you to track any colour substitutions you make. There is also a fabric layout chart. I'm looking forward to finishing this pattern -- I just need more hours in the day. 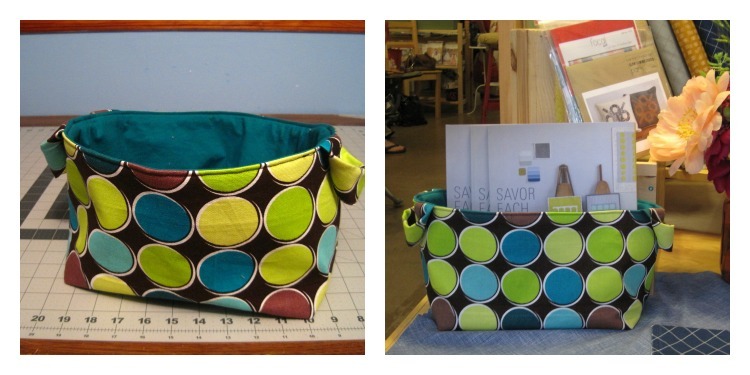 Find the link to enter the Craftsy Giveaway on each site during the hop. 50% discount on classes discussed in each post! 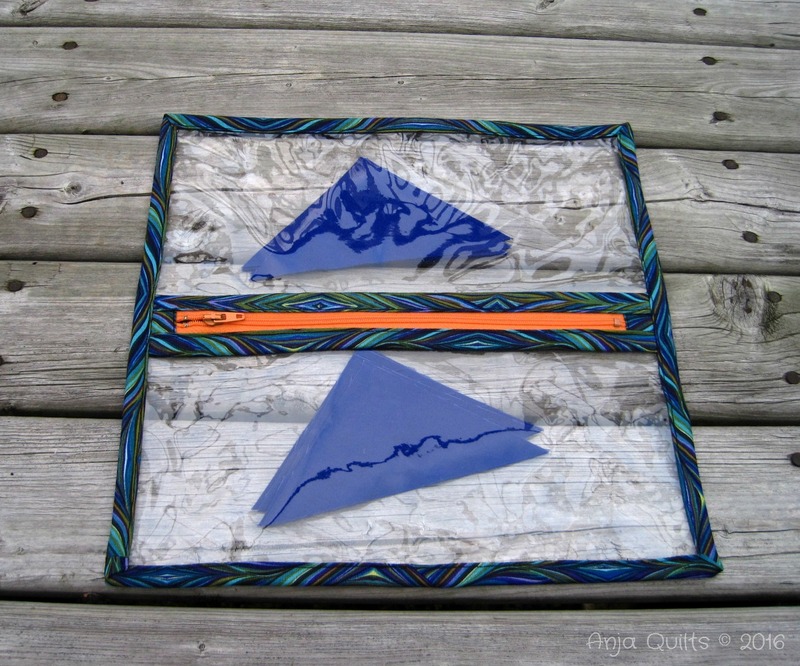 giveaways on some of the individual blogger posts! Three fabulous prizes from Craftsy! Two lucky people will win one class each, and one person will win this fabulous grand prize. Enter until Sunday, February 21, 2016, at 11:59 p.m. MST. The winners will be announced February 22 at Musings of a Menopausal Melon and at Pink Doxies. 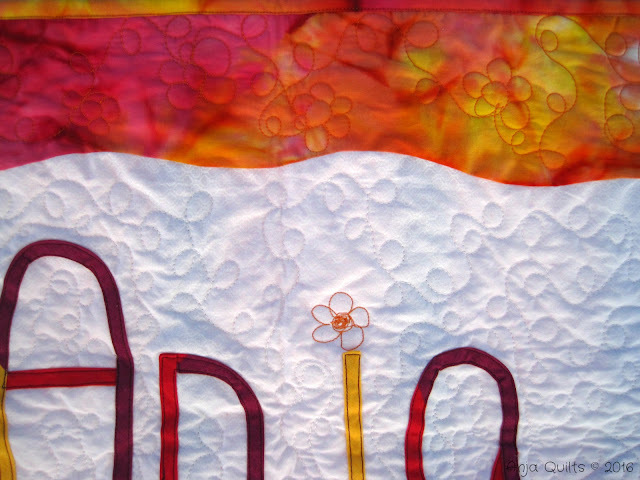 On Monday, I gave a sneak peek of my January project for the Mighty Lucky Quilting Club. I present my new wall hanging. 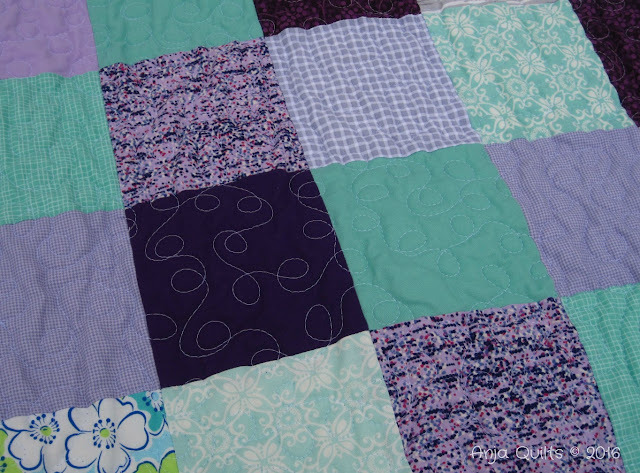 I tried three new things with this project: bias tape, curved piecing, and flower FMQ. 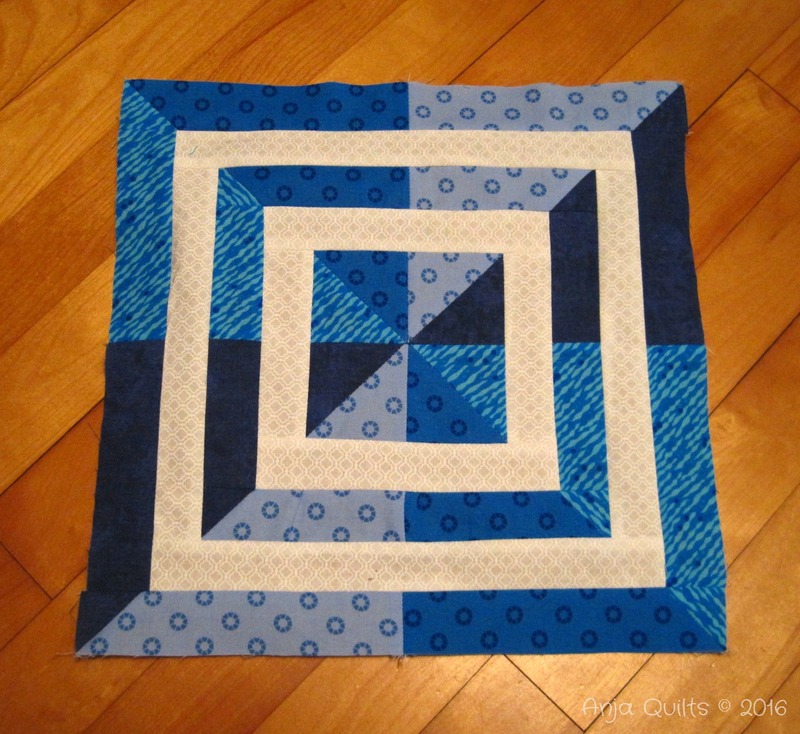 Thanks to my friend Linda @ Scrapmaster for talking me off the ledge and then through the FMQ process. And because the snow was there, a snow photo. This was another quilt kit I purchased from my LQS that I forgot about. 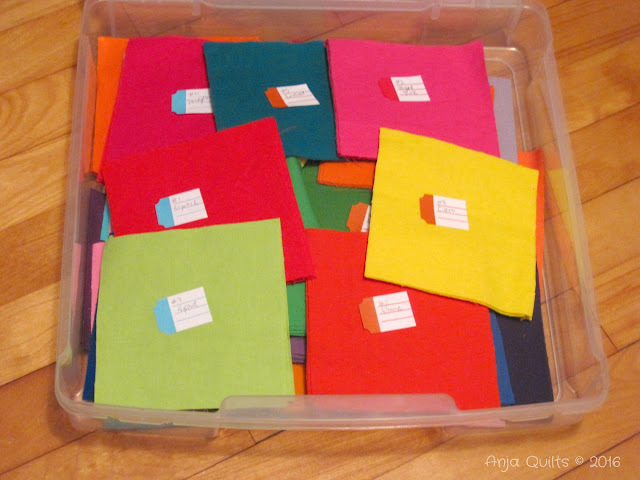 I think I purchased the kit because the fat quarters were so bright and colourful. But once I started cutting and piecing the blocks, I couldn't for the life of me remember why I purchased the kit. The pattern is so bizarre and doesn't suit the bold prints. 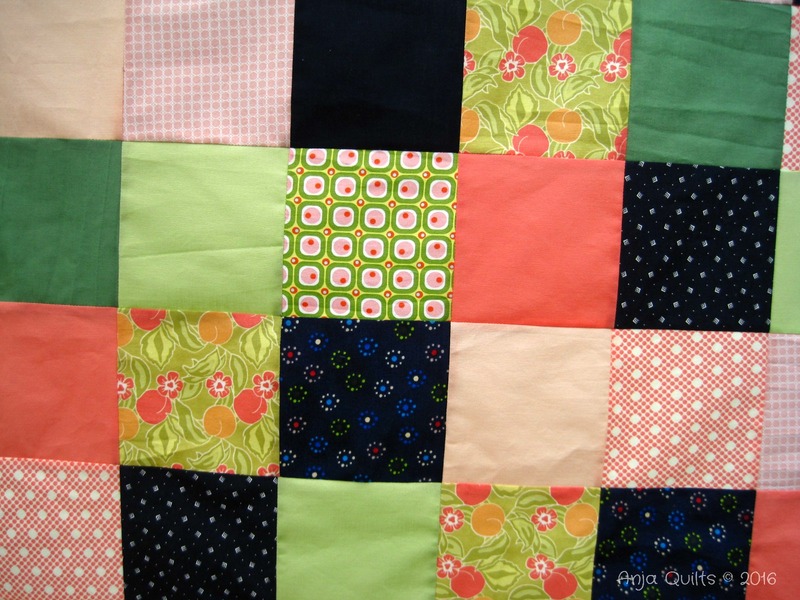 So I quickly decided to make two baby quilts instead of one large quilt and just pieced the blocks the best I could. These two will end up at our local children's hospital. Although I desperately need to organize my scrap bag because I can't find anything, I managed to find some fabrics to make two blocks. 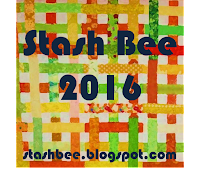 I'm participating in Stash Bee for 2016. Cyndi was Queen Bee for Hive 7 in January, and she asked for a Scrappy Diamond Block. All simple HST's. I also decided to make the Aurifil January block designed by Heather Valentine -- again all from my scrap bag. I found it hard to follow the pattern and lay out the pieces in the right order -- all pieces the same size were labelled the same letter, even though they were all different fabrics. Confusing. 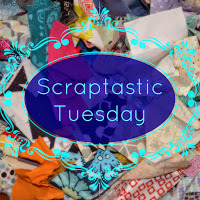 Linking up with Scraptastic Tuesday hosted by She Can Quilt. 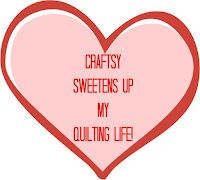 Head over to Musings of Menopausal Melon and to Pink Doxies for the start of the Craftsy Sweetens Up My Quilting Life blog hop -- and there's a great giveaway. 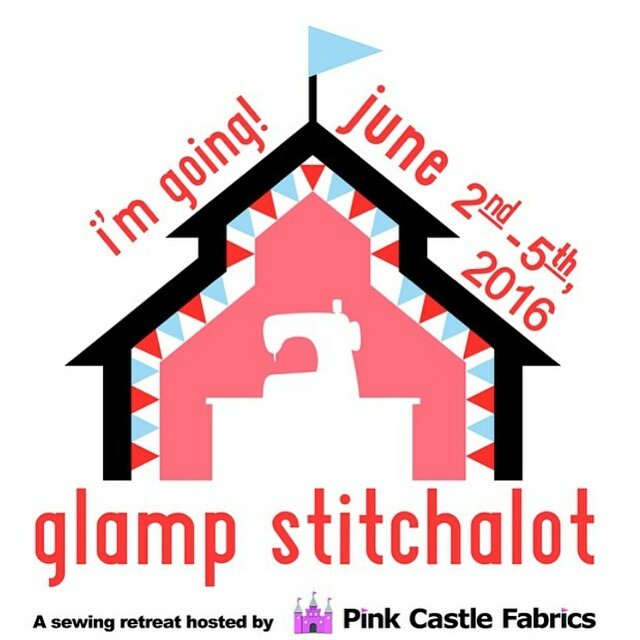 And stop by here on Saturday when I showcase a few patterns from Craftsy.